If you are new to the village or here on holiday, do come along and join us – we’re a welcoming bunch! Bible Study Group meets in Ellastone every two weeks throughout the year, except for Lent when we run a short, 6 week course, meeting weekly. It is an informal gathering, with a theme for discussion, with tea and coffee and, even though it is Lent, maybe biscuits too! This year we have decided to hold it during the day from 10.30am to 11.30am every Wednesday, starting on 6 March. There will be toys available for pre-school children, so that Mums or Dads can attend with their little ones too. It is a great opportunity to get to know other villagers and maybe inspire some thought about various issues too. Everyone is welcome, so please come along, even if you can only make one meeting. It will be held at the home of Hilary Dowson, Church Lane Cottage, Ellastone (opposite the church). The Lent Lunch at Stanton Village Hall will be on Friday 15th March from 12 noon to 2.00pm. On the menu will be a choice of delicious home-made soups, followed by a home-made scone or cheese and biscuits. Admission is £5.50 and the money raised will be in aid of the Bishop of Lichfield’s Lent Appeal and another good cause, yet to be decided. St Peter’s in Ellastone is a beautiful grade 2* listed building with an interesting history and stands proudly in the centre of the village. 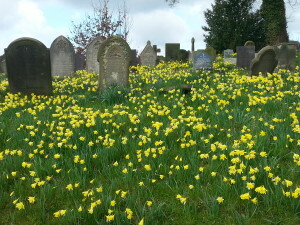 In the spring the churchyard is a riot of colour from spring bulbs – snowdrops, crocuses and daffodils. 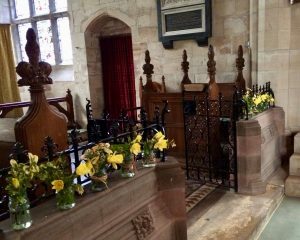 April – Sept the church is open to all on Sundays 10.00 – 16.00 …and is well worth a visit. There is a heritage exhibition and also the Calwich Chapel which has exhibits showing the links of the Church with the ancient Augustinian Priory of Calwich. Do pop in! 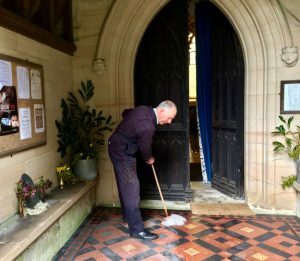 If you wish to visit at any other time please contact the church warden by phone only on 01335 324 859 and she will try to arrange a mutually convenient time. Martin is available on two days a week, plus Sundays, as well as Brian full-time. Martin covers on Brian’s day off (and vice versa). So Martin, are you local to this area of the country? – Not really. I was actually born in Teddington, Middlesex and grew up in the South East and then went to school in the Midlands, actually in Lichfield, which is a coincidence since I’m now working in the Diocese of Lichfield. So you could say, I grew up in a number of places. After finishing school I then went back to the South East to Wye College which is part of the University of London, but was based in a small country village in Kent right on the North Downs and there I did a degree in Horticulture. Why Horticulture? 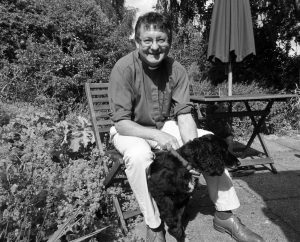 – Well that came from a childhood interest in gardens and gardening and whilst other boys wanted to be a train driver or fireman I wanted to be a fruit grower or farmer. And after College did you use your degree? – Absolutely. After college I first worked for 14 months in East Africa and helped start a small farm in Kenya for supplying produce to an orphanage home, and started to train young people in basic food-growing skills. I really enjoyed that and so when I came back to England, I worked for Buckinghamshire County Council as an Instructor in Horticulture to adults with learning disabilities. I did that for five years and really enjoyed that mix of teaching and horticulture. 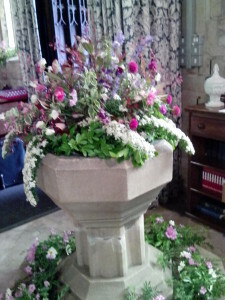 So, why a vicar and not say, a horticulturist, a teacher or a farmer? – Ah well that’s connected to my parents. They moved to a farm in Carmarthenshire in Wales. That early dream of being a farmer was still alive in me and I joined the family business to help develop the farm and use the land for my own related projects. Now back in Buckinghamshire I had been part of a very lively church and when I moved, I joined a local Welsh church which to be honest, was almost the complete opposite of what I had come from. But it was in that church where I met a truly inspirational Rector who started me to think about what I could do in, and for, the church. I had always had connections with the church since my school days and in fact my time in Africa had been with a Faith Mission. So the links were there and I began to think about ordination …….and the rest they say is history. I then studied for the ministry at Wycliffe Hall in Oxford and was then ordained at St David’s Cathedral in west Wales. When was that? – Oh around the late 80’s, 1989 to be precise. 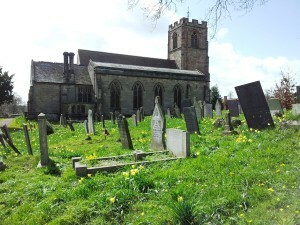 I then did two curacies in the diocese of St David’s before moving to Harrogate as an incumbent and then after some years in Yorkshire I moved to near Stourbridge in the Worcester Diocese where I was based at the villages of Kinver and Enville and have been there until moving to Mayfield. And you are also, I believe, a school Chaplin? – Yes that right. I started as the School Chaplain in a state boarding school, Old Swinford Hospital in Stourbridge, in 2006 and attained Qualified Teacher Status through the Graduate Teacher Programme. 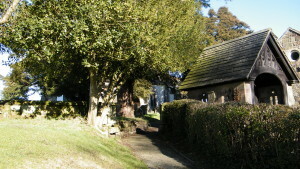 Initially it was also a teaching role but the teaching was swallowing up most of the Chaplaincy time, and so in 2010 I relinquished the teaching side and took on the parish of Enville, which is linked with the larger village of Kinver. And Enville is just inside the Lichfield Diocese, which is how I came to this Diocese. And I am still doing the chaplaincy role at the school on a part time basis. So the teacher in you is still there? – Well I suppose so. The school, established 350 years ago has a Christian foundation, and my work includes responsibility for collective and corporate worship, and pastoral care, alongside others, for the 650 boys and girls, and 100 plus staff. I am now working just two days a week and the chaplaincy takes up all that time; I work at the school Wednesday and Thursday and stay over Wednesday night. So why the move to Mayfield? – After 12 years in my previous role and with changes in my life I felt it was the right time to move and that God was calling me to take up a new challenge and a new ministry. When I heard about the Mayfield post, I visited the village several times and you could say I was hooked. I discovered a diverse and interesting village set in very attractive countryside and at heart I am a country person. There was evidence of a strong sense of community, and a church engaging with that community, over a long time, with warmth and imagination and desiring to grow. It was also a welcome surprise to discover two working textile mills in the village and I look forward to finding out more about them, and offering any support needed by those enterprises and their workforce. And finally as a country person what do you look forward to doing on your occasional days off from your two roles? – Well that’s both a country and a garden person! Obviously living in a beautiful area I want to start to explore both the Peak District and the Staffordshire Moorlands and Izzy will be going on a lot of walks in the surrounding countryside. In the past I have enjoyed fishing, but rarely have had time to pursue it, but in the land of The Compleat Angler I should like to restart that interest, and if there are local fishermen around to help all the better. And of course for a gardener and a horticulturist, I have a big project to undertake at the vicarage and I am really looking for inspiration and ideas from local gardeners in the village as to what I could do. I reckon that should keep me occupied along with my day jobs, but ask me again in a year and I will tell how much of that I have actually managed to achieve. Barbara has lived in the village for two and a half years. She has been married for 54 years and they have two sons, one who is a pilot and the other who is a chartered surveyor. They also have two grandsons and two granddaughters, all of whom are either at secondary school or university. She has been volunteering for the RSPB at Carsington every Wednesday for 7 years now. 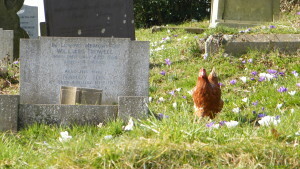 She is also a member of the Ellastone Bowls’ Club. 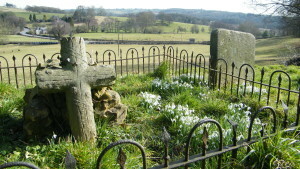 This fund is specially designated and any donations or legacies received can only be spent on Ellastone Church & Churchyard and cannot be used for any other purpose. It is ideal for those who support the church without perhaps attending services regularly to make their contribution. It enables restoration work that should be done (rather than has to be done) to be carried out (for example: work on two ancient trees, restoration of the Lych Gate and the installation of a modern electric winder for the clock in the church tower). The Cheddar Gorge. While no-one in the Church can see it, people outside can and it is a lovely feature of the village. church and a kitchen of the steeple.” Bells would no longer have been needed there, so they were most likely moved and installed when John Fleetwood built the Church Tower some forty years later. Calendar – 2018 Are you always looking up the dates trying to figure out when Easter is etc etc? Look no further as we have found this rather good site. Click on Christian Calendar. Daily Prayers: This great website contains a Christian Prayer for the day for every month of the year – 365 daily prayers. Discover how working together makes a real difference to the lives of thousands living in poverty around the world. You will always be sure of a warm welcome and a cup of coffee or tea after the service. 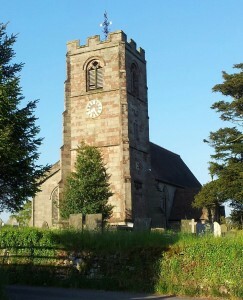 Bible Study and Fellowship Group A group of people from Ellastone and other parishes in the benefice meets about once a fortnight on Thursday evenings at 7.30 pm. We study passages from the Bible and their relevance to our lives and we enjoy each other’s company. All are welcome – contact Pam on 324094 for further details & dates. Do come and see us – we’re a friendly bunch!